The brilliant quiz book for clever kids - answer the questions correctly on your favourite subjects to test if you're a general knowledge genius. Children won't be able to resist the General Knowledge Genius brain-busting challenge. For every topic, pages are packed with eye-popp... read full description below. 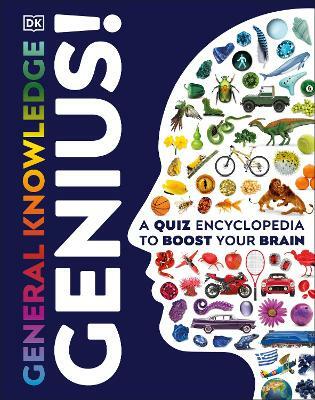 The brilliant quiz book for clever kids - answer the questions correctly on your favourite subjects to test if you're a general knowledge genius. Children won't be able to resist the General Knowledge Genius brain-busting challenge. For every topic, pages are packed with eye-popping pictures - but do you know what they show? To help you, Test Yourself panels list what you're looking for. With three levels of difficulty, the challenge gets harder as you work your way from Starter, to Challenger, and finally the truly tricky Genius category. If you need it, there's a fun fact with every picture to give a helpful clue. With more than 60 topics, from across the encyclopedia, there's something for everyone. Can you name the most famous rivers worldwide? Do you know your cranium from your clavicle, or do you need to bone up on the parts of the human skeleton? Are you a demon on dinosaurs, and able to spot the difference between an archaeopteryx and an allosaurus? Perhaps you're a brain box and can do all of this standing on your head? You can! Then what are you waiting for? Open the pages of General Knowledge Genius to find out what you know, and challenge yourself to learn even more!